Description: Heaps of tracks, save games, career mode, sandbox mode and apocalypse mode. BTD4 features improved graphics, loads of new and original tower types and tons of upgrades for each tower type. 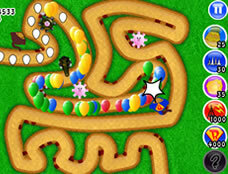 Bloons Tower Defense 4 will give you almost unlimited replay value. Balloons Go Up In Defense Budget Battle.